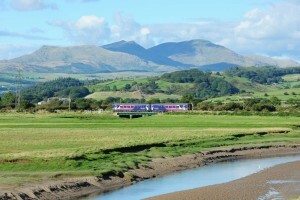 This page lists stations on the Cumbrian Coast line and some of those further south on the Furness line. Most stations have footbridges to cross from one platform to the other. Exceptions include Carlisle where there is a ramp, stairs and lifts and Barrow with stairs and lifts. 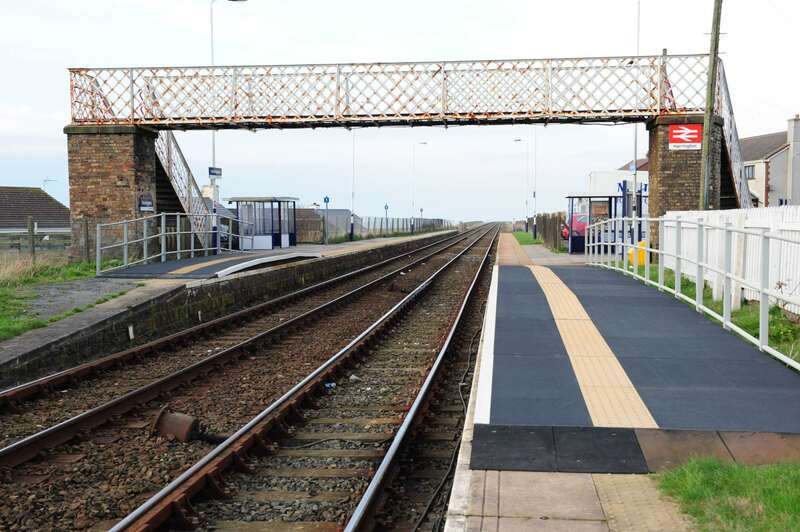 Maryport, Corkickle, Nethertown and Braystones only have a single platform. Whitehaven and Foxfield island platforms do not have steps. At Workington staff can help wheelchair users across the tracks. There is road access to both platforms at St Bees, Seascale, Drigg, Ravenglass (though a fair walk), Bootle, Silecroft and Askam. All stations except Nethertown and Braystones have ticket machines which normally take cards only. For the best views sit on the right hand side of the train from Carlisle, left from Barrow. There are lots of interesting places to visit from the line and many are listed below. A good initial site is Visit Cumbria. The station details below suggest some walks. 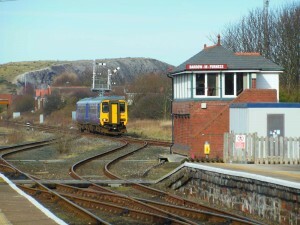 Northernmost station on the Cumbrian coast line. Most of our trains arrive at and leave from platform 2. This is a cross platform transfer for most services arriving from the south and for most trains to Scotland. For other trains you will usually need to cross to the other side of the station (platforms 4-8) by the ramp or lifts for trains south and alighting from Scotland as well as for the Tyne Valley line to Newcastle and the Settle and Carlisle line to Leeds together with some Dumfries trains. Good passenger information screens, toilets, food and drink and ticket office and machine. There is a roughly hourly pattern of trains direct to London, Newcastle, Edinburgh, Dumfries and Manchester Airport with an additional London train via Birmingham. Glasgow has two trains an hour. Leeds has seven trains a day and there are eight through Dumfries to Kilmarnock and Glasgow. Sunday has a lesser service on many lines. The station has had a £15m upgrade with a complete new roof to be followed by renewed anti-slip platforms. Carlisle castle, cathedral and Tullie House museum are the obvious sights but it is also a major shopping centre with The Lanes indoor centre and all the usual shops. It is also a good point to explore Hadrian’s Wall by train or bus and very close to the Scottish border. Station is a little outside this pleasant commuter village on the outskirts of Carlisle. Only access between platforms is a footbridge. It has wifi to access live train running information on smartphones. There is a walk from this station. Well kept station looked after by a friends’ group and just up the hill from the town. Only access between platforms is a footbridge. 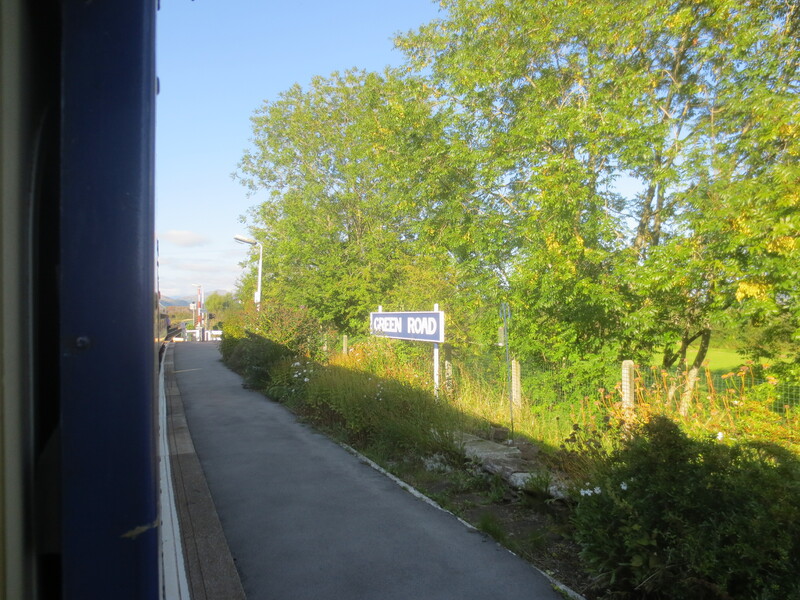 It is a link to Silloth which was developed as a railway town and seaside resort in the nineteenth century but whose railway line was closed fifty years ago. Nowadays take a bus either from here or from Maryport (timetable). Station next to cheese factory and a short walk from the village centre. Only access between platforms is a footbridge. It has wifi to access live train running information on smartphones. 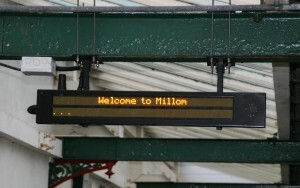 Single platform station with passenger information display. It has the excellent Senhouse Roman Museum which contains the best collection of Roman altars in the country. Roman fortifications continued down the coast from Hadrian’s Wall through Maryport to Ravenglass and then inland to Ambleside. Also here is an attractive harbour with an aquarium, the Wave centre with its climbing wall and a maritime museum. Currently the England coastal path runs from Allonby, five miles north accessed by bus (timetable), to Whitehaven but will eventually stretch all round the Cumbrian coast. There is a walk from this station. Fabulous views out over the Irish Sea at most stations from here down the coast. Access between platforms is a footbridge and a barrow crossing. There is a walk from this station. Busy town station with a ticket office and passenger information displays. About ten minutes’ walk or frequent buses from the town centre where most facilities are. Access between platforms is a footbridge although when staffed wheelchair users can be taken over the tracks. Workington Transport Heritage Trust runs a small café and shop most weekdays 1000-1730. The Helena Thompson Museum is run by volunteers. Workington has a reasonable shopping centre and buses through the Lakes to Cockermouth, Keswick and linking to the west coast main line at Penrith. Together with Whitehaven it is the start of the C2C (sea to sea) cycle route across country to Sunderland or Newcastle. Trains officially take two cycles – but often more – but space cannot be reserved. There is more room on the loco hauled trains if you are with a group. There is a walk from this station. Village station on the edge of Workington has wifi to access live train running information on smartphones and the first to have a Harrington hump to raise part of the low platform to a reasonable height, something which now applies to most stations on the line. Only access between platforms is a footbridge. It is the start of another walk through Parton to Whitehaven along old railway lines as an alternative to England’s coastal path. There is a walk from this station. Small village which has mostly been moved further up the hill since the line was built. Only access between platforms is a footbridge. The station is below the site of the Roman fort at Moresby which also has an attractive Georgian church. There is a pleasant walk along the old wagon way beside the railway and the sea into Whitehaven which is part of the walk mentioned above. There is a walk from this station. Island platform, ticket office, toilet and passenger information displays. It is a Georgian planned town with many interesting buildings such as St James’ church. It has three museums – the Beacon on the harbour side, the Rum Story reflecting the town’s links with the slave trade and Virginia and (currently closed) the Haig Pit Mining Museum up the hill at Kells. The only cliffs in north west England are south of here at St Bees Head and much of the coastline is owned by the National Trust. Along with Workington start of the C2C (sea to sea) cycle route across country to Sunderland or Newcastle. There is a walk from this station. Corkickle is a single platform with a passenger information screen at the southern end of Whitehaven town centre and the Whitehaven tunnel constructed because Lord Lonsdale would not allow tracks through the town centre. Customer information screen at Corkickle. St Bees has road access to both platforms and a listed arts and crafts style signal box. It is a seaside village with a proper promenade, beach ice cream shop and good pubs. It is the start (or end) of the Wainwright Coast to coast walk to Robin Hood’s Bay. 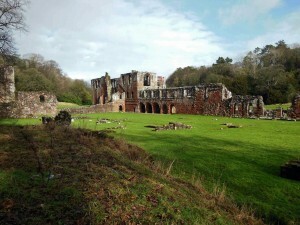 The Priory is worth a look with parts dating back to Norman times. Customer information screen here. The West Cumberland Railway Museum at 24 Main Street is generally open 1000-1600 for a week a month. Contact Peter Rooke petergrooke@btinternet.com for more details. There is a walk from this station. These are both single platform stations with only a few trains stopping there and no ticket machines. They are notable for the beach bungalows built between the wars for Whitehaven residents, newer holiday parks and for the views out over the Irish Sea to the Isle of Man. The station has passenger information screens and a toilet. This is primarily the stop for the nuclear recycling facility with footbridge access to one platform. There is a footpath to Seascale beside the railway and the sea. Locomotives and nuclear flask containers are usually seen parked in the sidings. There is a walk from this station. 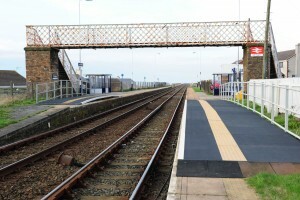 Seascale has two platforms with road access between and has passenger information screens. It was developed as a railway resort in the nineteenth century in the same way as its more successful neighbours at Grange over Sands and Silloth but never really took off. Excellent ice cream shop and café to go with the sands. The parish council had commented on trains and got this reply. Customer information screens here. There is a walk from this station. 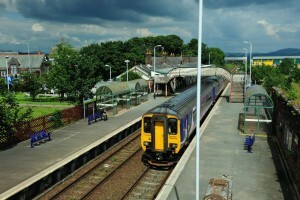 Drigg has two platforms with road access but the level crossing can be closed up to ten minutes before a train. Excellent gardens on the platforms and adjacent café, gift shop and pub. The low level waste depository is next to the station. Walk down the road from the station to a quiet beach or through a nature reserve and back to Seascale along the beach. There is a walk from this station. Ravenglass has wifi to access live train running information on smartphones. It has a pub – the Ratty Arms on the platform as well as other facilities in the village. Fabulous views over the estuary next to the station. From here through Bootle to Silecroft is in the Lake District national park. There is a Roman bathhouse signposted ten minutes’ walk away. This is the southern end of the Hadrian’s Wall complex along the Solway coast. Ravenglass has the distinction of being in two Unesco world heritage sites as it is also in the Lake District. Muncaster castle is a mile up the road with excellent gardens – particularly the rhododendrons in May – and a quirky castle to visit. The main attraction for many is La’al Ratty, (la’al being Cumbrian for little as in the La’al Indian restaurant in Whitehaven) – otherwise the Ravenglass and Eskdale Railway 15 inch gauge line which runs from here through Eskdale to Dalegarth near Boot. Trains run for 45 weeks in the year with between two and 14 trains a day each way. Most trains are steam hauled. It has a museum at Ravenglass reopening in June 2017 and cafes and playgrounds at each end. You can book through tickets to Eskdale from anywhere on the Northern Rail network and save money especially if you use railcards and also saves time queueing. Allow at least 15 minutes to change back to the main line (you can call it that here!) as Ratty trains are often a little late, and it takes several minutes to get from one station to the other. There is a walk from this station. Bootle has two platforms and a level crossing and is one mile from its village but spawned another small village called Bootle Station. It is close to a small beach and to Eskmeals Ministry of Defence range where you may hear firing. Inland are views over the fells notably Black Combe. This is another station at a level crossing with a road down to a quiet beach and an easy walk to Black Combe. Millom has passenger information screens, a café and toilets and a privately-run ticket office linked to the Millom Discovery Centre which gives a good overview of the history of the town, its most famous son the poet Norman Nicholson and its industrial heritage including the new rail room. It is a short walk to the Hodbarrow nature reserve and a walk or bus ride to Haverigg for the beach (and Cumbria’s only prison). Millom is a quiet town with a charm of its own. There is a walk from this station. Green Road is also situated at a level crossing. Beware stations called ‘Road’ – it usually means a long walk to the village concerned, in this case The Green (not to be confused with the station of that name on the Ratty at Eskdale Green). It lives up to its name with well-tended gardens. Foxfield has an island platform with a path across the line. It used to be the junction for Coniston but now only serves Broughton in Furness a mile away. 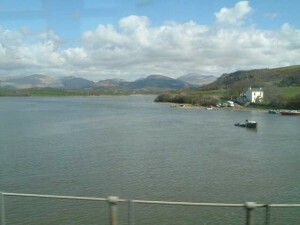 There are good walks on the Duddon marshes and the Prince of Wales pub and microbrewery http://princeofwalesfoxfield.co.uk/ outside the station is popular for its beer and food (though closed Monday to Thursday lunchtimes). There is a walk from this station. It has a footbridge to reach the water side platform. 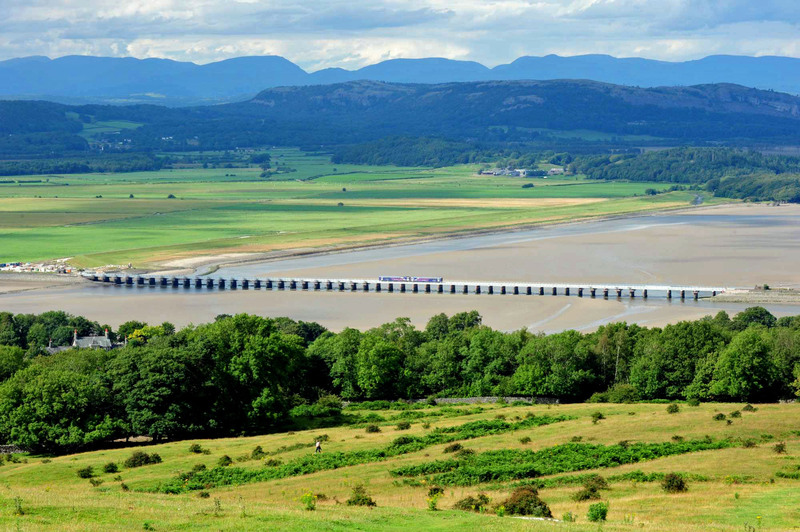 From here you start to see back over the Duddon estuary to Millom and ahead to Barrow, only a couple of miles apart over the water though much more by rail or road. 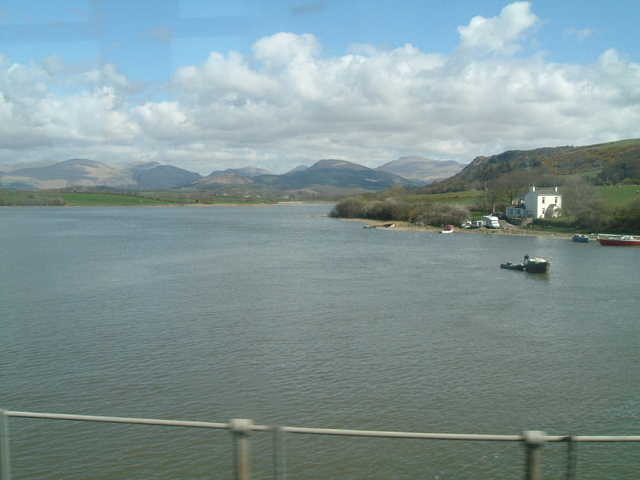 Askam is also at a level crossing and is a popular commuter station for the villages of Askam in Furness and Ireleth. Barrow is the end of the Cumbrian coast line and of the Furness line to Lancaster and Preston. It has a ticket office, passenger information screens, café, toilets and lifts. 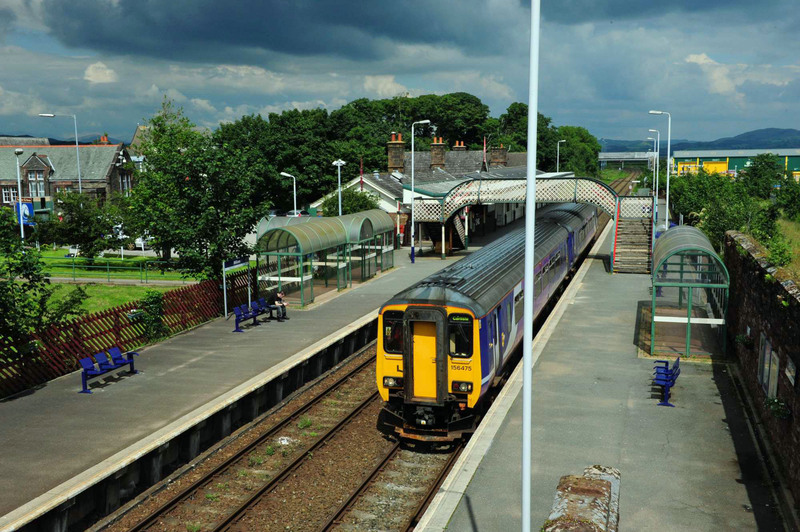 Trains from Carlisle either arrive on platform 2 or 3, both on an island platform accessed by the stairs or lifts. 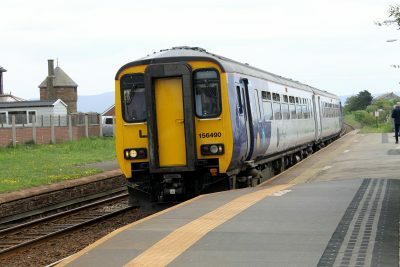 Northbound trains that start in Barrow usually go from platform 3 and through trains from Lancaster from platform 1 which is by the entrance. 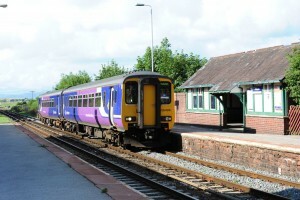 Furness line trains usually arrive from the south on platform 1 and often return south from there meaning that unless you catch one of the few through trains you will need to cross to or from platform 1. Trains from here usually go to Lancaster with many continuing to Preston, Manchester and Manchester Airport and run roughly hourly. The town hall is a splendid Victorian edifice modelled on Manchester town hall. The dock museum is worth a visit and you cannot fail to see Devonshire dock where BAe make submarines. 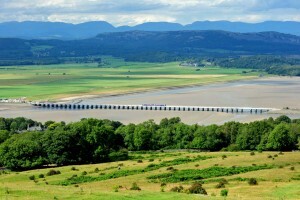 South of Barrow the good views of Morecambe Bay continue once you pass Furness Abbey and as far as Arnside. Lancaster on the west coast main line for trains to London, Birmingham and Manchester and to Morecambe, Heysham, Skipton, Leeds and Windermere.